Goalkeeper Tom Heaton was under the illusion that the Clarets had prolonged their Premier League survival scrap when beating Hull City. The 29-year-old admitted that the spectacular ovation from thousands of travelling Burnley supporters housed within the KC Stadium last weekend had successfully thrown him off the scent as far as the club’s status in the top flight was concerned. In the aftermath of Danny Ings’s 62nd minute winner, Heaton joined manager Sean Dyche and the remainder of the squad in applauding that fanbase with the belief that results elsewhere had gone their way. However, en-route to the dressing room, with the noise of the away fans still reverberating around the stadium, the one-time Manchester United trainee learned his side’s true fate. Victories for Sunderland, Leicester City and Aston Villa accompanied by Newcastle United’s stalemate with West Brom had condemned the Clarets to another term in the Championship. “I can’t speak for anyone else, but at that point I thought we’d taken it to another week,” confessed Heaton. “Not knowing the other results I wasn’t aware how everyone else had got on and the reaction of the fans was superb. “I went down the tunnel and saw that everyone else had won. It was one of those things unfortunately. We did what we needed to do that day, we couldn’t do any more in the situation that we were in. 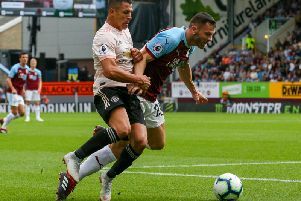 According to statistics on worldfootball.net, fixtures involving Burnley as the away team, on average, have been the best attended in the Premier League this season. That figure, taking in to account the forecast for the attendance at Villa Park on the final day of the season, averages out at 37,439. “They’ve been fantastic,” said Heaton. “I’ve been impressed - that would be a fair word. The support and travelling support to away games has been incredible. “I’ve been at teams relegated in the past and it can be tough for fans. They want to see performances and results and at times this season we haven’t won the games but the support’s been unrelenting. Heaton added: “Probably one of the highlights for me was the away support on Saturday. It was incredible. I’m sure most of the fans knew the situation as well, whereas on the pitch, well I didn’t know at the time. But you would never tell that, listening to them at the end of the game.